Cecelia Reynolds is stunned, to say the least, when attending a friend’s wedding she comes face to face with an old flame. Keith Emerson happens to be officiating the ceremony. It doesn’t take long for her to realize their love never died. However, twenty years have gone by since they last saw each other. During that time, Cecelia has a very successful career, plus a loving husband and twin sons. She couldn’t be happier or so she thought. Keith’s reappearance in her life reawakens feelings she thought ended a long time ago. Cecelia finds herself in an impossible situation which causes her to do things she never thought she was capable of doing. It all leads to secrets, lies and a self-awareness she didn’t have before. Plan Cee shows how Cecelia’s entire life molded her into the woman she has become today. 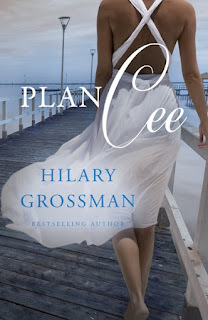 Hilary Grossman touches your heart with her writing. She has created a realistic cast of characters in realistic situations. I have to admit, I didn’t love Cecelia throughout this book. There were times I wanted to shake her. I couldn’t understand the decisions she made, but I couldn’t stop reading either. I had to know why she did the things she did. This book shows how good people aren’t perfect. You don’t always know what’s going on in someone else’s life and you can’t question their choices. By the end of the book, I was rooting for Cecelia to succeed. Although this is a sequel to Plan Bea, it can be read on its own but it’s more fun to read both of them. Both books are women’s fiction at its finest. I hope to get to Plan Bea and Plan Cee soon. I'm glad you enjoyed this, Yvonne! Clever title(s)! Hilary is a wonderful writer. Thank you so much for such an amazing review, Yvonne! I am so glad you enjoyed Plan Cee.